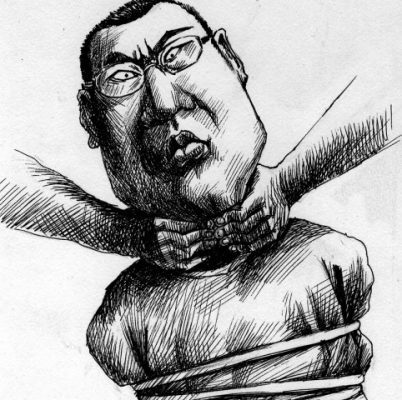 A 2010 cartoon by Kuang Biao showing Chang Ping under pressure. Most readers will remember Chang Ping as a news editor until 2001 at Southern Weekly, the relatively outspoken paper based in Guangzhou that has fallen on tougher times since a staff walkout there in 2013. He was later an editor at Southern Metropolis Daily, another paper under the Nanfang Daily Group with a reputation for pushing the envelope — but was forced from this position in 2008 after a strongly-worded commentary criticizing China’s policies in Tibet. Chang continued to write for various publications under the news group until he was finally forced out in 2011. The essential argument Chang makes in this commentary is that the Chinese Communist Party has never at any point relinquished its Cold War rhetoric in the domain of news and ideology, and has never halted its preparation for an ideological showdown with the West. In fact, he says, the wealthier China has become, the more it has invested in its bid for ideological dominance. The recent announcement of the creation of “Voice of China,” says Chang, is only the latest chapter in the Party’s campaign of ideological opposition, which is colored by a nationalism driven by a narrative of victimization. The 16-character mantra may offer more than just a metaphorical lens for understanding China’s actions globally. The West is suffering various forms of democratic exhaustion. The United States is retreating. And China, as evidenced by its second Human Rights Council resolution in nine months and other international actions, is clearly on the offensive. “The organizational structures of China Central Television (China Global Television Network), China National Radio and China Radio International are now eliminated. The original names are to be retained domestically, while externally they will now be all known under the name ‘Voice of China. '” This is a passage from the Chinese Communist Party document called Program for the Deepening Reform of Party and Government Organs, a document that is full of word usage and grammatical problems — suited to the rashness and ignorance of leader in the new era. Many internet users [in China] gleefully shared a joke about a report on Xinwen Lianbo, the official nightly news program, that went: “News from this station: this station is now eliminated.” But in fact the intent of the Program was not to eliminate these media, but rather to combine several official media into a single entity, renaming it the “Central Radio and Television Network,” to be called “Voice of China” (中国之声) externally. I suspect that my colleagues at Voice of America and Deutsche Welle (meaning “German Wave” but translated into Chinese as “Voice of Germany”) feel a certain strangeness at this. Radio France Internationale (RFI) has recently been referred to the Chinese official Party media Global Times as “Voice of France.” Other media similarly named include “Voice of Tibet” (西藏之声) and “Voice of Taiwan” (台湾之音) — and in history there was “Voice of Free China” (自由中国之声) and “Voice of Asia” (亚洲之声). All of these media perhaps feel that they are different from one another, but in the eyes of the Chinese Communist Party they are all essentially “voices of the hostile foreign forces” (境外敌对势力之声), and China must have in response its own “voice.” Moreover, that voice must be even more powerful. Make no mistake, this naming of China’s new network is no mere coincidence, but a purposeful collision with your names. Thirty years after an end was declared in the Cold War, this assertion has been constantly in doubt. Quite a number of articles in the New York Times in recent years, written by a range of observers, have pointed out that the Cold War as an ideological struggle has never passed. Unfortunately, most of the attention has turned on Russia, and has overlooked the importance of China’s role. But today, China’s influence surpasses that of Russia in a number of areas, and [overlooking this fact) is an error that researchers cannot afford to make. Over more than half a century, the Cold War media of which “Voice of America” was most representative sought to break through restrictions on information in the socialist camp, and to spread Western concepts of democracy. They offered massive amounts of news and cultural programming, reaching audiences through shortwave radio, and made huge contributions to the victory of the West. After an end to the Cold War was declared, and the West underwent an ideological shift, these media said goodbye to their old mission and entered a new era. They sought an exit from their Cold War mindset, to tone down their propaganda hues, and to become more objective, independent and comprehensive modern media. This didn’t happen just in the media. The think tanks that had been supported and funded by the government during the Cold War experienced similar changes. Twenty-eight years ago, Chinese students and city residents set the stage for dramatic change. Very quickly, the socialist camp collapsed [on a global scale] and those on the front lines in China fell in a bloodbath. Western societies, eager to celebrate their victory, buried their heads in the sand and believed that China had opted into a new international order. China feigned civility on the one hand, while declaring on the other that “Western hostile forces have never given up their desire to destroy us.” Not only did China not, as the West did, remove, disband and transform its “forces” deployed for media and intelligence activities, but in fact it continued to invest greater resources in its Cold War thinking as it grew in economic strength, building a formidable external propaganda system. “Voice of China” is one result of these efforts. While one side unilaterally declared an end to the Cold War, entering a post-Cold War era marked by tolerance and diversity, the other side strengthened its state propaganda apparatus, making a large-scale attack on the free world. “Voice of China” can work unhindered on the global internet, while Voice of America, Deutsche Welle, Radio France Internationale and others are restricted by the Great Firewall, left an environment arguably worse than that of the shortwave radio environment during the Cold War. 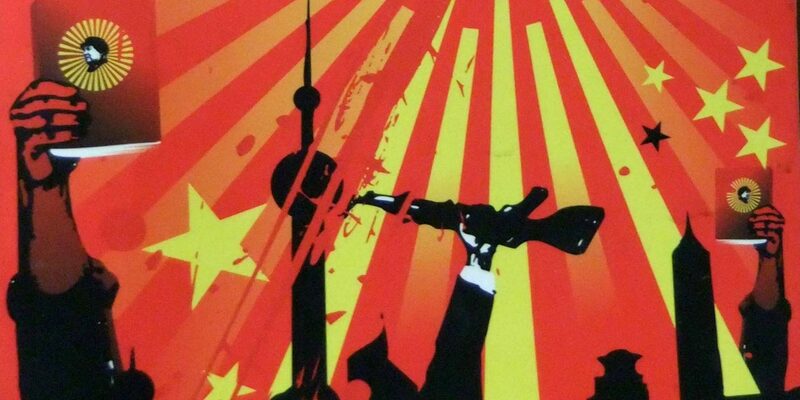 Western societies cannot possibly retreat to the point of the Cold War Era. But at the same time they must face the challenges brought by the rise of China. Chang Ping, a veteran Chinese journalist and commentator, currently lives in Germany.